Anxiety refers to thought and behavioural issues that result from excessive fear and anxiety. Fear is best described as an emotional response to a real or perceived threat, whereas anxiety focuses on the anticipation of a future threat. Anxiety may often be described by words such as stress, worry or nervousness. Every day we live under some level of pressure where anxiety can sometimes help us to prepare for difficult or stressful times. We can often regulate the feeling of anxiety through relaxation techniques, hobbies, exercise, entertainment or talking with someone. In a best case scenario, the feelings of anxiety are shortlived and we return to our normal day to day routines without any major disruption. However, in some cases, these levels of anxiety are more intense and prolonged and as a result, the effect on our lives becomes more disruptive and abnormal. Anxiety is classified as a disorder once the symptoms of anxiety become chronic and disrupt our ability to function in our daily lives. Anxiety is not always easily defined in terms of behavioural experiences. One person may initiate coping mechanisms that are internalised through poor concentration, poor memory, and avoidance behaviours. Alternatively, another person may exhibit anxiety externally through physical symptoms such as shortness of breath, sweaty hands, and physical weakness. Art therapy helps facilitate cognitive disruption by moving attention away from rumination. This redirection of attention away from worrying then helps to regulate the nervous system. Art therapy allows us to express ourselves visually and rely less on verbal expression. Verbal expression can be a difficult task if a client is catastrophising. The feelings of being overwhelmed can make verbal expression difficult which then negatively impacts the clients perception of self-managing feelings and thoughts. 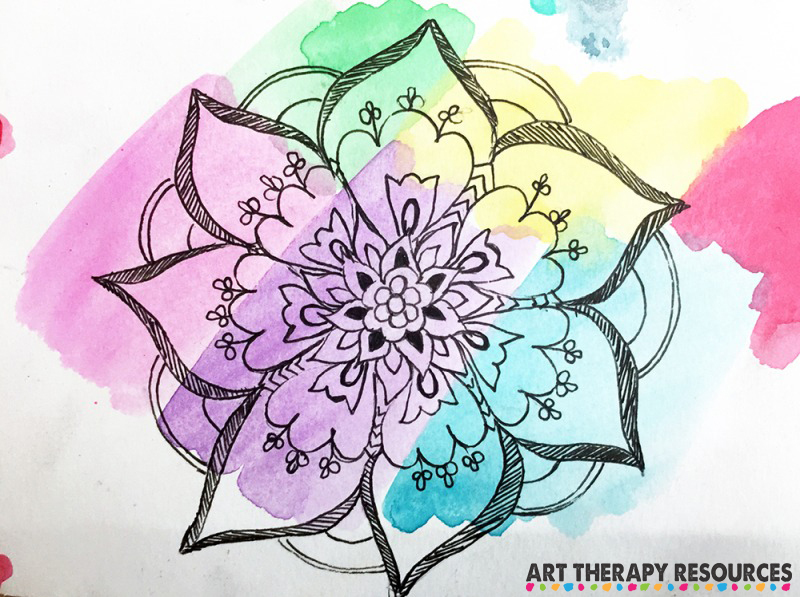 Art Therapy can benefit clients by initially diffusing a stressful environment in the therapy setting. Techniques will help the client feel calm and able to focus on the task at hand. Once this anxiety is defused, the client is then more open to process thoughts, emotions and assess behaviour. Art therapy can also assist anxiety by improving self esteem, resolving problems, expressing feelings, problem solving and goal setting which aids in working towards improved thinking patterns. The mind and body are closely connected and can influence each other in a feedback loop whereby the mind creates feelings of tension in the body, and heightened feelings in the body leads to overthinking in the mind. 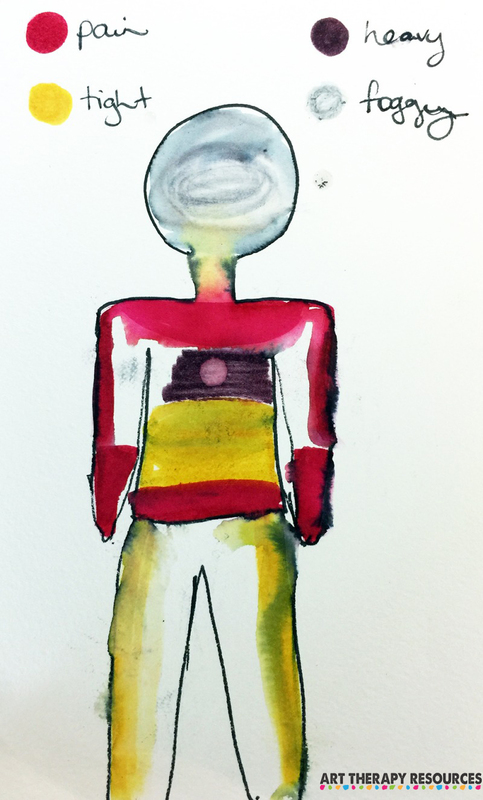 In this exercise, ask your client to use a pencil or pen to draw the outline of a body. Before your client draws the body outline, ask them to take a minute to reflect on physical feelings in their own body in this moment and consider if their body is feeling any tension, pain or discomfort in any areas. Incorporate the knowledge of these physical feelings when drawing the body outline. Ask your client to draw a large circle to represent a thought bubble. Inside the thought bubble, ask your client to draw or write words to brain dump all of the issues they are currently feeling anxious about. Do this exercise in a minute. Using a shortened time frame will help your client “dump” their worries and reduce the possibility of rationalising or minimizing their feelings of anxiety. Each label may be represented multiple times. Ask your client to use journaling as a method of exploring gratitude within their life. This exercise can be done generally by exploring all facets of your client’s life or it can be done with a specific focus on a situation that is causing your client anxiety. For eg. If a situation at work is causing anxiety, the gratitude journaling could focus on things to be grateful about in their employment outside of the stressful situation that exists, ie helpful colleagues, good pay, interesting work etc. 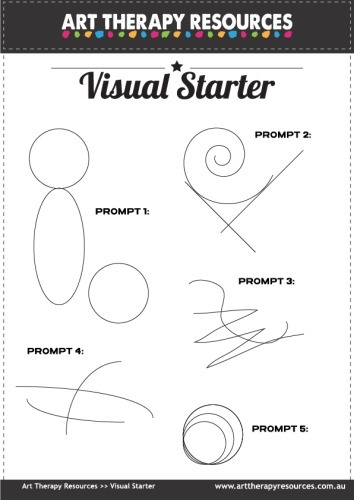 Reduce your client’s anxiety about creating art by providing a visual starter to help loosen them up. Use the download provided as a stimulus to create an artwork. A number of prompts are provided in the download. You can use each prompt to create various individual artworks or use all of the prompts for a larger artwork. 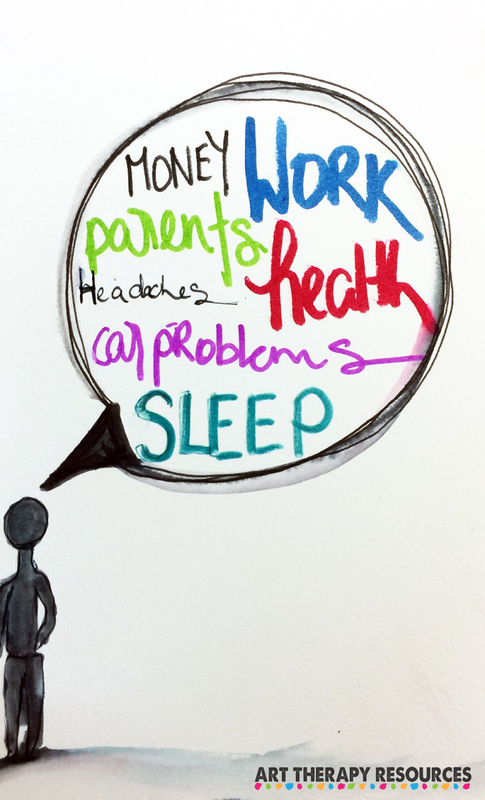 Ask your client to draw a cloud where all of their worries can be placed inside. Your client can then transform their drawing to show their worry cloud being blown away by the wind. As clouds also reshape, your client can use this metaphor as a process of reshaping their own worries. Ask your client to create their own castle of comfort. The castle can have many levels that contain many of the personal comforts your client has. Your client can use this comfort castle as a process of implementing coping strategies to deal with anxious feelings that arise. Introduce your client to mandala drawing. This ancient art form helps with feelings of anxiety as they require focused attention to create the patterns. The repetition of patterns and rhythmic movements help to reduce heightened emotions. A replication study ( Can Coloring Mandalas Reduce Anxiety? A Replication Study ) also supports the hypothesis that colouring a mandala reduces anxiety. Similiar to mandala’s, you can introduce your client to creating their own patterns. An artform called Zentangle has emerged in recent years which falls under this category of pattern drawing. 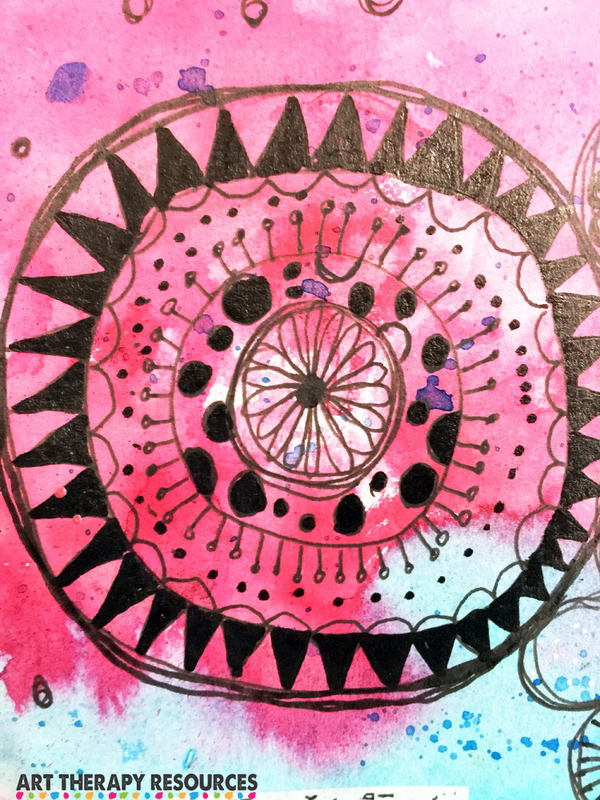 Zentangles are miniature pieces of abstract patterns that are defined as “artistic meditation” through the process of focused attention in creating the patterns. Watch this video for an example of creating patterns. Ask your client to create an affirmation card or series of cards that they can carry in their purse or wallet. At any time they feel anxious they can look at the affirmation card and reflect on the affirmation to help them deal with their anxious feelings. 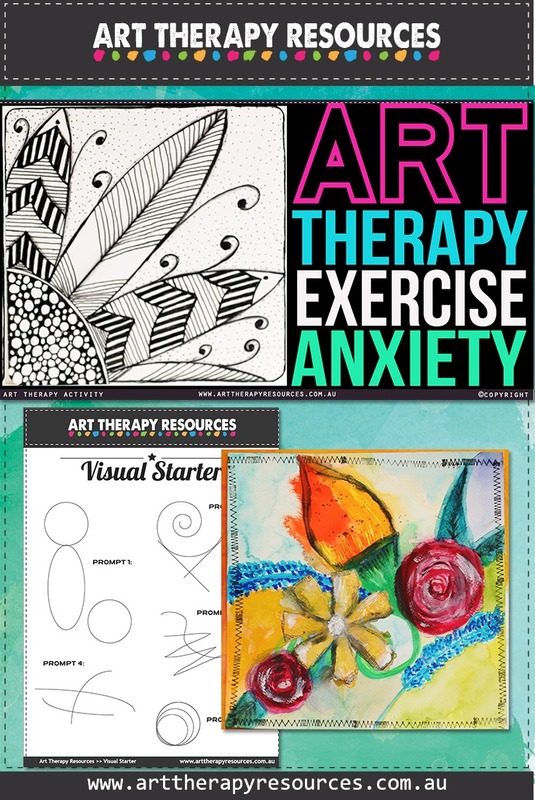 SIGN UP below to download the FREE pdf containing Visual Starter images to use in this Art Therapy Exercise.